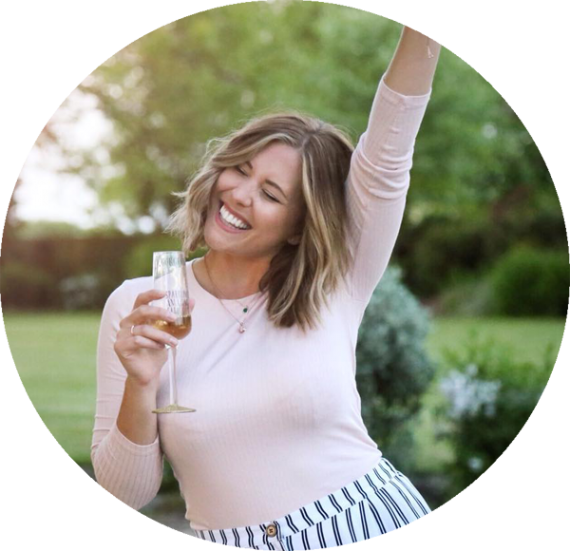 Drum roll please…the nail art is back! 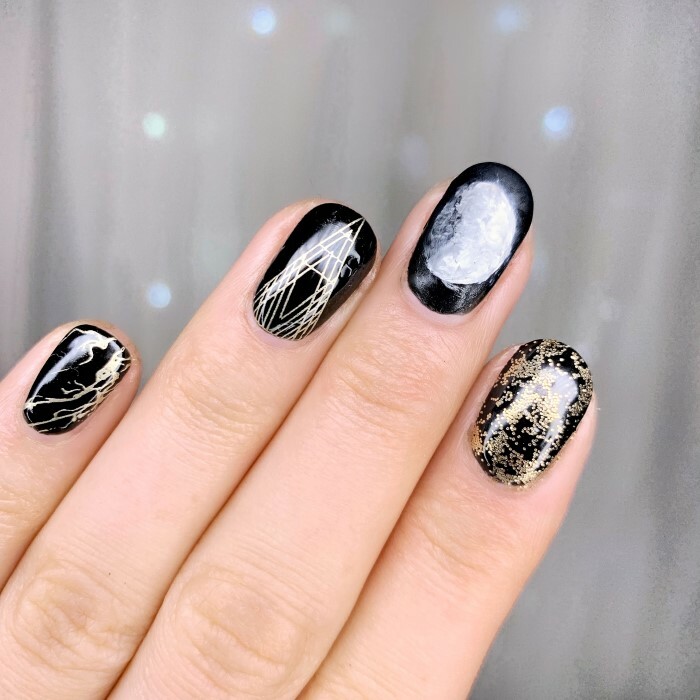 It’s been a while since I played with all my stamping plates and glitter but over the last month I’ve really gotten back into it all and decided to bring it back to the blog! Who remembers all the old stuff from the tumblr days! Well I’ve recently got my hands on some new plates from Maniology (who used to be Bundle Monster) and started to have a play over gels because i’m far too clumsy for regular polish these days. 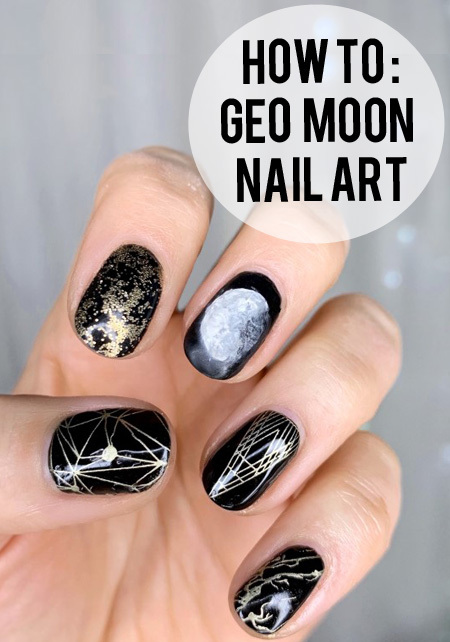 Here’s how I created this Geo Moon Nail Art – which is nearly up to my old standards! More practice required…although you don’t have to ask me twice! Paint all your nails with a base coat and two coats of Black polish – cure appropriately for your gel in between layers. 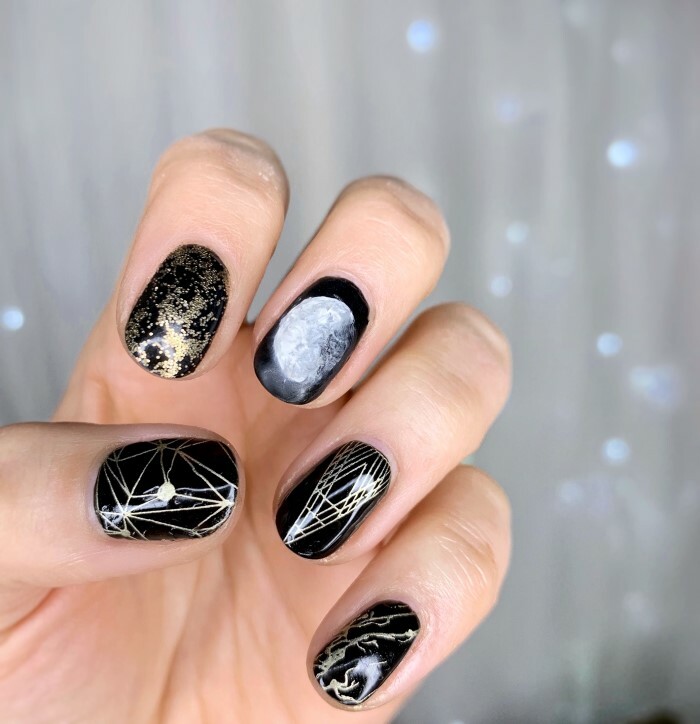 Paint on your freehand moon with a nail art brush, toothpick or bobby pin – I followed this tutorial on Youtube – with white and black polish until you’re happy with the design. Stamp on your designs with the clear stamper and gold stamping polish – there are lots of different stamping techniques, have a look on youtube and find one that works for you! Apply a layer of base coat to your forefinger, cure but don’t wipe so it stays a little tacky. Gently press on loose glitter in patches and use a toothpick to move around and create the finished effect. Once dry, top coat all nails (using the matte top coat again on your middle finger! ), cure and wipe! And there you have you Geo Moon Nail Art over gels which will last for up to 4 weeks! What do you think?